Instead of resisting the darkness and absence of activity, use it to light the flame inside your heart. To help you do so, we are sharing a beautiful mediation/contemplation written by Jack Stucki, subtle energy researcher from Beulah, Colorado. From the point of LIGHT within the mind of LOVE, may all awaken to that same LIGHT within our own mind. From the point of LIGHT within the heart of LOVE, may all awaken to that same LIGHT within our own heart. From the center where the will of LOVE is known, may all awaken to serve the purpose of this will; the purpose of which the awakened know and serve. From the center where the race of humans is known, let the plan of LIGHT and LOVE work out to engage in dance with the darkness. Let the power and purpose of LOVE and LIGHT guide our awakening to ONENESS. We look forward to seeing you in 2018: for the new year’s holidays, in our ongoing classes at the studio and The Downing Museum, and in our new weekend series and class! New Year’s Eve class. On New Year’s Eve, Frances will offer our usual holiday schedule, a 9 a.m. Mixed-level class. Join her to conclude your year with yoga! Please note that this will be our only class on this Sunday. New Year’s Day class and Potluck Brunch. On New Year’s Day, Angie will teach at 10 a.m., and then we will gather in the lounge for our traditional potluck brunch to ring in the new year together. Please join us for class, for the potluck, or for both! Wellness Series on Saturdays. In January, Cassandra and Angie are excited to offer a 4-week wellness series on Saturdays at 11 a.m. Each week one of these 90-minute classes will explore another aspect or two of self-care: Pilates, hatha yoga, mindfulness meditation, Anjali Restorative yoga, somatic (body-focused) meditation, and mindful eating. To read more and access the registration link, check out this post. Yoga for All Series on Sundays. Limited space remains in Ashley’s 4-week Yoga for All series, which will meet on Sundays at 2 p.m. and provide an accessible introduction or re-introduction to yoga. For more information and to register, see this post. 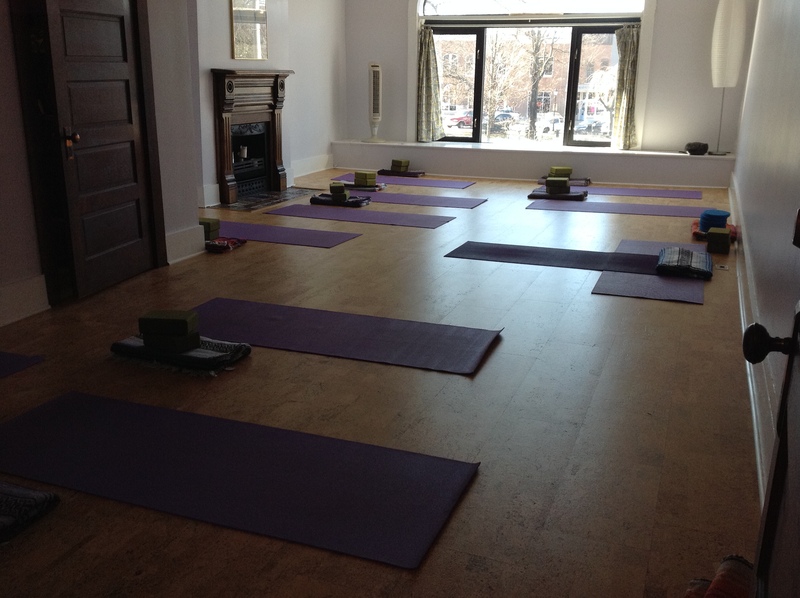 New Basics/Restorative class on Saturday afternoons. Chie enhances our weekend schedule with a new hybrid class combining the best of both a more active yoga practice and relaxing, restorative poses. Join her on Saturdays at 4 p.m.
Yoga and Meditation opportunities at The Downing Museum. If one of your goals for 2018 is to visit local treasures, join us for our monthly classes at The Downing Museum. This month Angie will teach the yoga class on Saturday, January 13, and Alice will continue to lead the meditation class, which meets on Saturday, January 27. For details and to register, see this post. Living Our Yoga Yin class. On Friday, January 26, Alice and Angie kick off the 2018 Living Our Yoga Yin series, typically held on the last Friday of each month. As in past years, the classes will be team-taught, offer conventional yin asanas (poses), and address aspects of yoga that go beyond the poses. In 2018, we are excited to be exploring several of the Yoga Sutras together. For a full list of January classes, please see the online version of the calendar or pick up a hard copy at The Pots Place. We also post updates each morning on our Facebook page, should you find it convenient to keep up with us there. The studio is waiting for you! This entry was posted in holiday, meditation, new class, party, schedule, series and tagged January, Living Our Yoga, wellness, Yoga for All. Bookmark the permalink.